What is faith? Middle school English students had quite a few ideas on the topic! 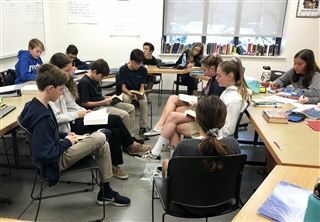 During a Harkness fishbowl, students are split into groups of participants and observers. Participants discussed religion in Life of Pi, while observers made notes on the information, including the participants' ability to provide info, build upon others points, reference the text and more.